My system for sorting my scraps is very basic. 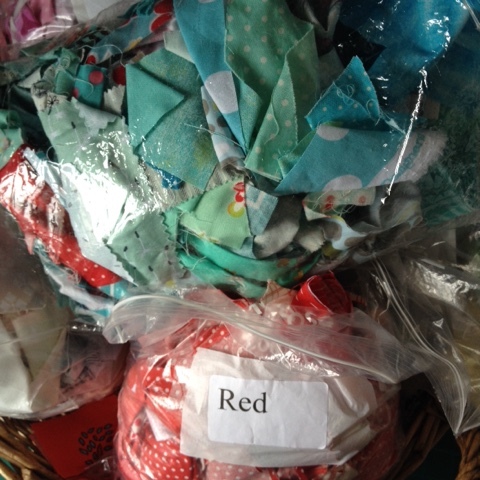 I have a basket with bags for each major colour and when I have scraps, I add them to the basket. About one a quarter I take my basket to my morning quilt group and sort any loose scraps into their correct bag. I chose not to cut the scraps into specific sizes like Lori Holt advocates and I do the cutting when I want to make something. We did a scrap swap at the Simply Solids retreat and I came home with more than I took, so I think a bigger basket will soon be needed. what do I consider a scrap? 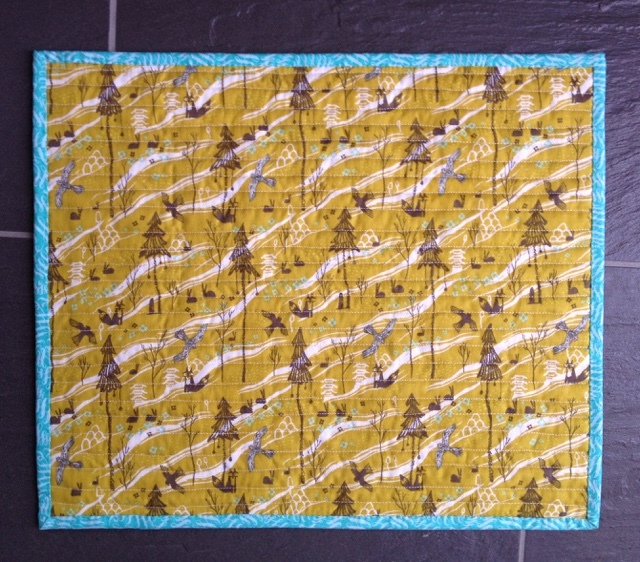 A part strip from a project, odd charm squares, fabrics I no longer love but would use in a scrappy quilt. Also at the Simply Solids retreat, my friend Carol won a copy of Lori's Cozy Cottage 2016 calendar. As Carol already had a copy she was happy to swap with me for my prize of fabric. 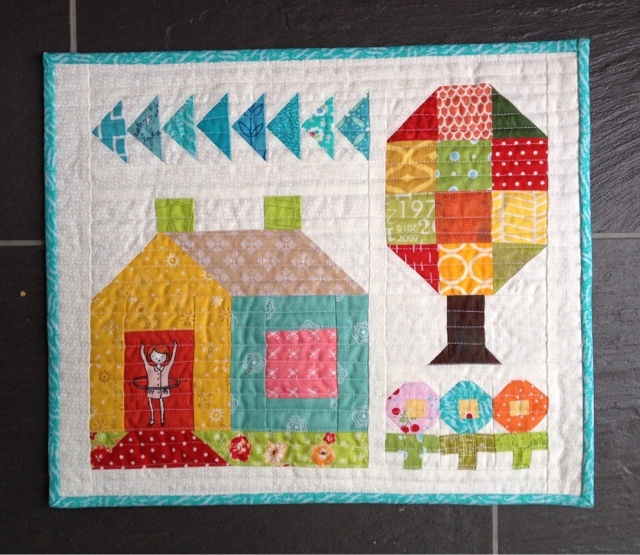 As part of a blog hop, Lori showcased this mini quilt which uses the cosy cottage pattern from the calendar. I dived into my scrap bags and pulled and cut fabric like a mad woman. The window of the house is some Blueberry Park hand printed fabric which was someone's scrap. I had been looking for just the right project to use it in. The girl with her hula hoop was fussy cut from an older Aneela Hoey print. I'm also pleased with how it turned out. For the quilt backing I used a fat quarter that isn't my cup of tea but it came in a bundle and the off cuts have gone into the scrap basket. The binding also came from my scrap basket and was pieced and ready to go. So remainders of binding also go in my scrap basket. 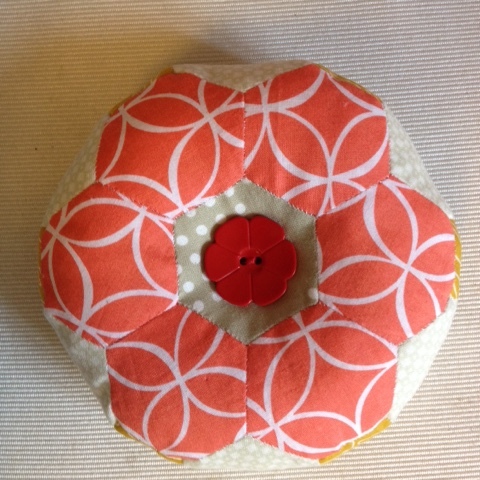 This doughnut pincushion was a kit from Sew and Quilt from our retreat good bags, but paper piecing is always a good use for scraps. And I love the perfect buttons from a friend's mother's button box which I was given last year. 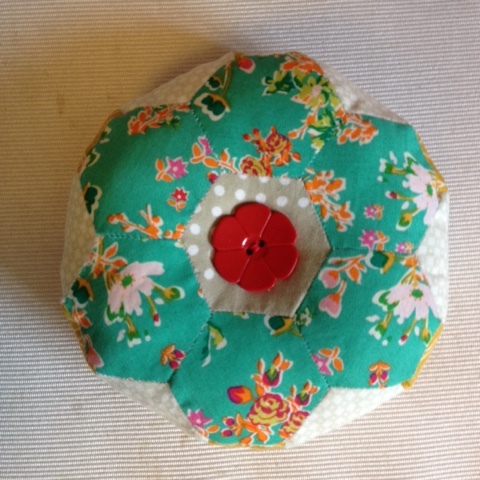 Scraps of wadding were used to stuff the pin cushion and that was another scrappy project from last week.